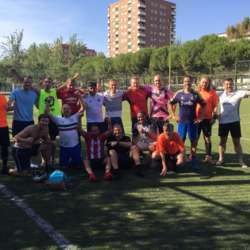 If you are in Madrid and willing to play some football, this THURSDAY, specially for hard lovers of this game, we'll have our one hundred-twenty-fourth additional Weekday InterNations Madrid Football game! We have players with different skills, levels and ages, so don't hesitate to join! It i s going to be our one hundred-twenty-fourth game on the labour day, not on weekend. Hopefully this year we will have enough skills, and permanent players to be able to join a competitive local football (soccer) league.